TestDriven.Net has always supported parameterized test methods when used with the MbUnit testing framework. When using MbUnit, it is common for a single test method to execute multiple tests with different parameter inputs. The most famous of these test types is the MbUnit RowTest. Until now there has been little reason to add support for executing parameterized tests using NUnit (historically NUnit has only supported parameterless test methods). However Andreas Schlapsi has recently written an implementation of MbUnit's RowTest using NUnit 2.4's Addin extensibility mechanism. I've updated TestDriven.Net 2.11 to better support NUnit add-ins and enable the targeting of RowTests and other parameterized test types. This version also includes a workaround for a log4net related issue that was causing a noticeable delay when launching the NUnit 2.4 GUI. You can find the release notes for TestDriven.Net 2.11 here. Download and install TestDriven.Net 2.11. Download the RowTest Extension for NUnit 2.4.5 (Binary). Create a directory called 'addins' in '%ProgramFiles%\TestDriven.NET 2.0\NUnit\2.4'. Copy the 'NUnitExtension.RowTest.AddIn.dll' file into the 'addins' directory (don't put any non-assembly files there). Add a reference to 'NUnitExtension.RowTest.dll' from your NUnit test project. You can then start writing and executing MbUnit style RowTests inside your NUnit projects! You can find Peli's original RowTest example here. 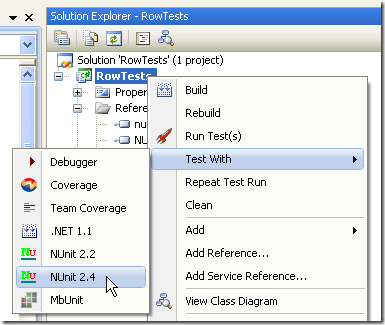 To view your RowTests inside the NUnit GUI you will need to use 'Test With > NUnit 2.4'. You will find this option on the 'Solution Explorer' project context menu. Thanks to Wayne Brantley for letting me know about the RowTest Extension for NUnit. When running row test my setup and teardown methods are being ignored! Any reason for this? What other test types does MbUnit have where "it is common for a single test method to execute multiple tests with different parameter inputs"? The RowTest functionality is now built into NuNit from 2.4.7 onwards (NUnit.Framework.Extensions), so no external add-in is required any more. "Helo there, effectively I genuinely see that your revealed content material is somewhat thoughtful since it highlights an assorted vary of interesting information. Anyway, was curious whether or not you'd prepared to exchange links with my net site, as I'm searching to assemble internet links to additional enlarge and acquire floor for my website room. I don't truly mind you finding my contacts on the sitewide site, just accepting this links on this unique link is extra than adequate. Furthermore, please attain me at my internet portal if you're eager within the hyperlink exchange, I'd seriously like that. I would like to thanks a lot and that i hope to obtain a reply from you as soon as achievable! " I wish obtaining over a broken heart might be so easy as following a couple of steps..
"Super-Duper internet site! I'm loving it!. Will occur back once again - getting you feeds also, Thanks." "Have you ever regarded as including much more videos with your blog site posts to maintain the readers much more entertained? I mean I just study by means of the total post of yours and it was rather beneficial but since I am far more of a visual learner,I found that to get additional helpful. Just my my thought, Beneficial luck "
An individual built many advantageous facts presently there. I did searching with regard to within the challenge and also noticed a lot of men and females might agree inside your internet page. It frequently amazes me specifically how internet site owners for example your self can come across enough time along with the commitment to carry on creating great weblog posts. Your site isgreat and 1 of my should read web sites. I just had to thank you. Great post but I was wondering if you could write a litte more on this topic? I'd be very grateful if you could elaborate a little bit more. Kudos!